When the radio plays “Last Christmas” for the first time, we know, it’s time for our annual Christmas event. This year we started the day with a group breakfast @NETZ. 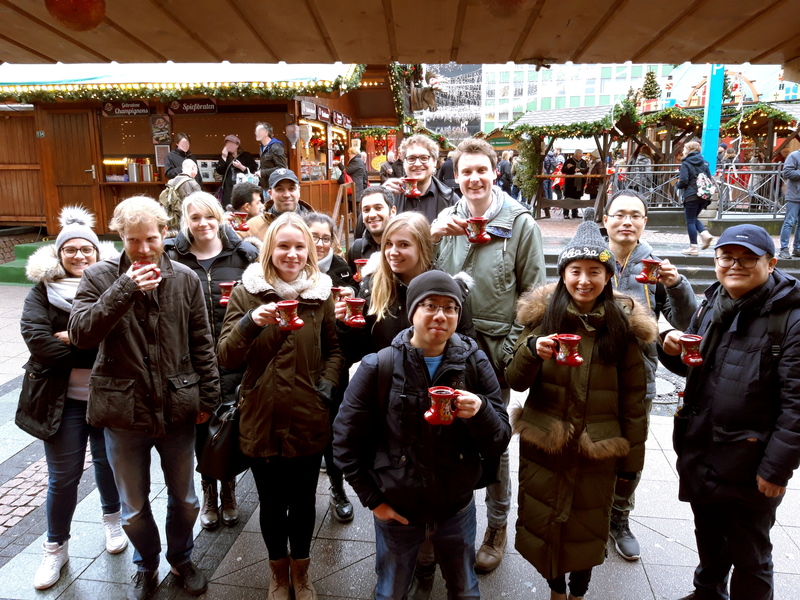 Next stop was the Christmas market in Essen, where everyone tasted our traditional Feuerzangenbowle. After a quick visit, we went bowling and enjoyed the end of the evening by a tasty diner. Many thanks to the entire group and special thanks to Steffi for organizing the group event. The whole group participated at the CENIDE celebration 2018. This year the event was located at the SANNA-Building of the Folkwang University of Arts in Essen with a stunning view over the Zollverein World Heritage. The building regarded as an architectural masterpiece with a path-breaking energy design and unites industrial with the modern. During the presentations and talks, André gave a short speech about the Dannie-Heinemann Award. Following the talks, Steffi represented the group with an amazing poster, of course everyone from the group supported her during the session. Thanks to CENIDE for organizing this evening full of exciting talks and discussion. Find more pictures in our Event section! Congratulations to Nicole Janoszka for successfully completing her Master Thesis! As part of the University Duisburg-Essen and University Alliance Ruhr, André participated at the second Materials Chain International Conference (MCIC 2018) in Bochum, Germany. The conference highlighted recent trends in materials science and production technology and gave insight into current top-class research in this area. Four core research areas of Materials Chain: Functional and structural characterization, modelling and simulation, processing and synthesis and of course production engineering where addressed in 11 sessions by 12 leading international guest speakers, like Prof. Olli Ikkala (Aalto University, Finland), Prof. Evelyn Hu (Harvard, Cambridge, USA), Prof. Michael Moody (University of Oxford, UK) and many more. Further, Andrea from our group got the chance to represent herself as well as the group with an amazing poster during poster sessions. Left. Picture of Prof. O. Ikkalla, Dr. M. Franke (orgainzation team) and André. Right. Together with Dr. Markus Müllner (University of Sydney), André is funded by the German Academic Exchange Service (DAAD) and the Universities Australia with the Australia-Germany Research Cooperation Scheme for the next years. Due to the knowledge of Markus Müllner’s group in the fields of complex and multifunctional nanoscale materials for applications in catalysis, energy storage, sensing and medicine, the project combines ideally the research interest of both groups. For more information please visit our Research section and the homepage of the Müllner group (polymernanostructures.com). 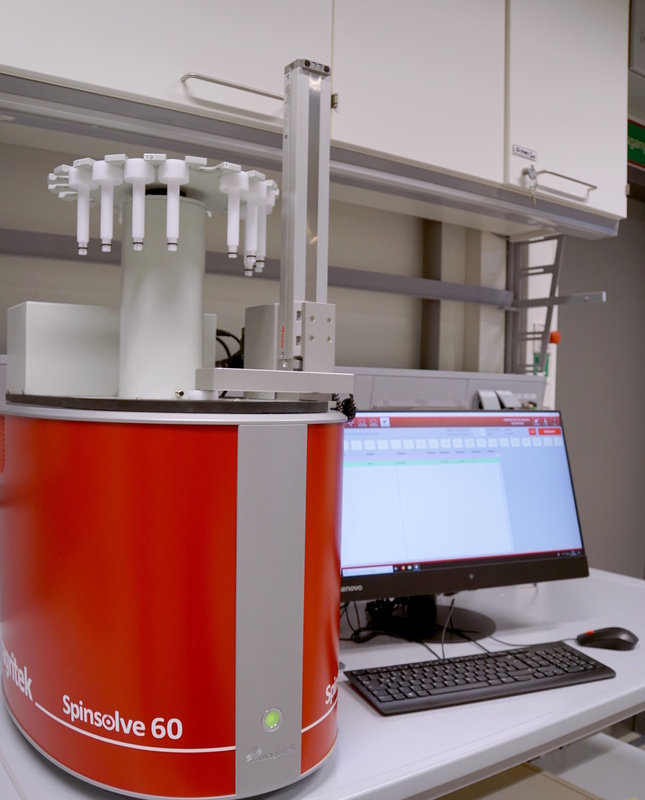 Our analytics lab is now equipped with a Magritek Benchtop NMR in combination with the worlds first autosampler for this instrument. 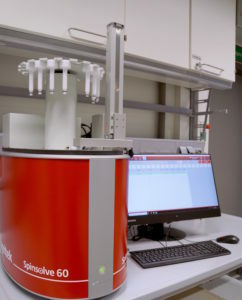 Spinsolve® is a pretty neat setup to perform 1H-NMR measurements, follow polymerization kinetics, and to identify the structure and purity of simple samples. The permanent magnet is quite easy to handle and doesn´t need more than a power socket to run. With 64 scans, spectra show a good signal-to-noise ratio. This NMR will help to speed up characterization quite a bit. This is currently the only NMR instrument at Campus Duisburg, so anyone is welcome to stop by and measure some samples. As part of the University of Duisburg-Essen (UDE), Center of Nanointegration Duisburg-Essen (CENIDE) and the ruhr metropolis in North Rhine-Westphalia the group participated at one of the youngest and largest science festivals in Germany, ScienceNight Ruhr 2018. We opened the doors to our laboratories at NETZ-building and nearly 1200 visitors of all ages enjoyed the experience of science. The visitors and our MacroLab-team explored together in a series of experiments the world of chemistry and macromolecules. “Molecules so big that you can see and touch them” was the topic for our kids & adults polymer chemistry-team. Liquid sand and water for juggling were just a few of the things they created together with the visitors. Thanks to Alex for representing the ScienceNight and our group in the local TV boradcasting. André was invited as keynote speaker during the international conference on self-assembly of colloidal systems (SACS 2018). Aim of the conference was to bring together some of the most active and recognized researchers in the interdisciplinary field of self-assembly. The use of assembled particles and colloids as a tool to design functional colloidal materials with tailored properties was discussed by outstanding chemists, physicists, theoreticians and engineers like Sébastian Lecommandoux (University of Bordeaux - INP), Luis Liz-Marzán (CIC biomaGUNE, San Sebastian), Francesco Sciortino (Universitá La Sapienza) and many more. 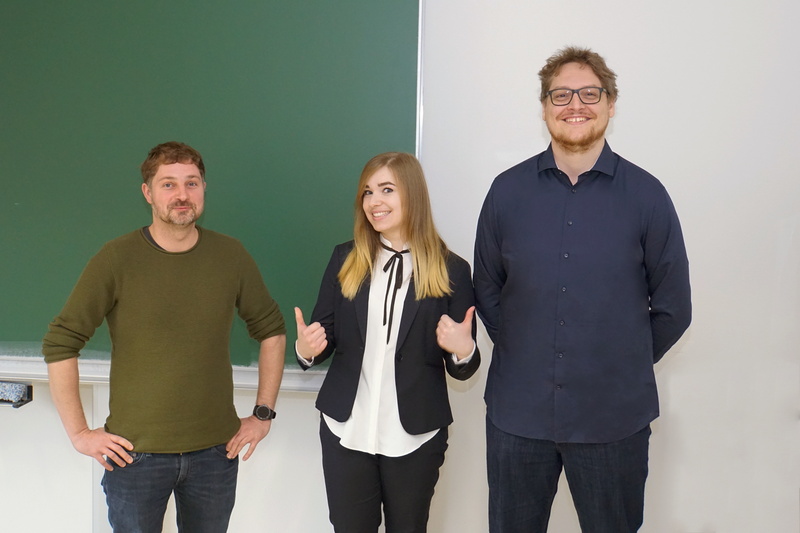 The conference was also a great chance for Giada, Stefanie and Alexander to get in contact with other researchers and PhD´s like Tobia Cavalli from the UnterlassLab. Further, Stefanie got the chance to represent herself and the group during her poster presentation. Great job! 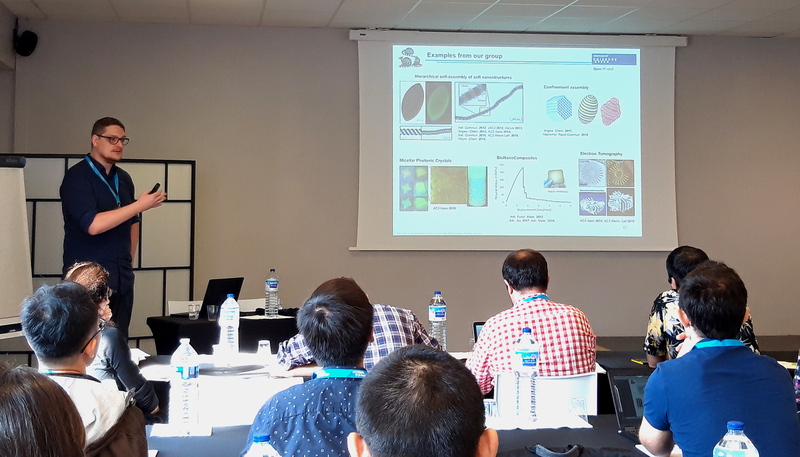 André was invited to give lectures on high precision synthesis and assembly of macromolecules at the SoFun’2 school “Soft Matter for Functional Materials” in Bordeaux. The summer school focused on the design of materials with tailored properties and functions elaborated based on soft matter. Moreover, the lectures included topics of characterizations methods and the theoretical aspects of soft matter. About 50 participants, including the PhDs Giada, Stefanie and Alexander paid attention to the great talks of André, David Pine (New York University), Nicholas A. Kotov (University of Michigan), Marcus Müller (Georg-August-Universität Göttingen) and many more. The venue at the Aerocampus Aquitaine in direct vicinity of Bordeaux offered a fascinating atmosphere for exchanges of ideas. Thanks to Dr. Emilie Pouget (CBMN, Bordeuax) for this great organization. Find more pictures at our gallery @Events. Prof. Orlando Rojas followed our invitation to give a CENIDE Science Talk on August 29 at the Essen Campus in lecture hall S07S00D07 at 11:15 am. He is a world renowned researcher on nanocellulose, which a highly promising biomaterial with countless applications including wound dressing, ultratough nanocomposites, flame barrier material, filtering or ultra high surface area carbon materials. The Image on the right shows CNFs, a biofibers of polysaccharide biopolymer, with typical dimensions of 10-20 nm in width and several micrometers in length. The talk is followed by another invited lecture given by Prof. Jochen Gutmann from the UDE and the DTNW, also revolving around the topics of biopolymers and textiles. More information about the talk can be found here. Update: both talks were very inspiring and attracted a well-sized audience of about 50 people despite the summer break. The presenter both shared cutting edge and applied research demonstrating the enormous use of nanocellulose in science and technology. Orlando stayed the day for BBQ at the NETZ and for discussions with André on projects. On 30.08., Orlando met with various groups of the UDE and had great brainstorming on running projects at the UDE and the potential to collaborate in the future. 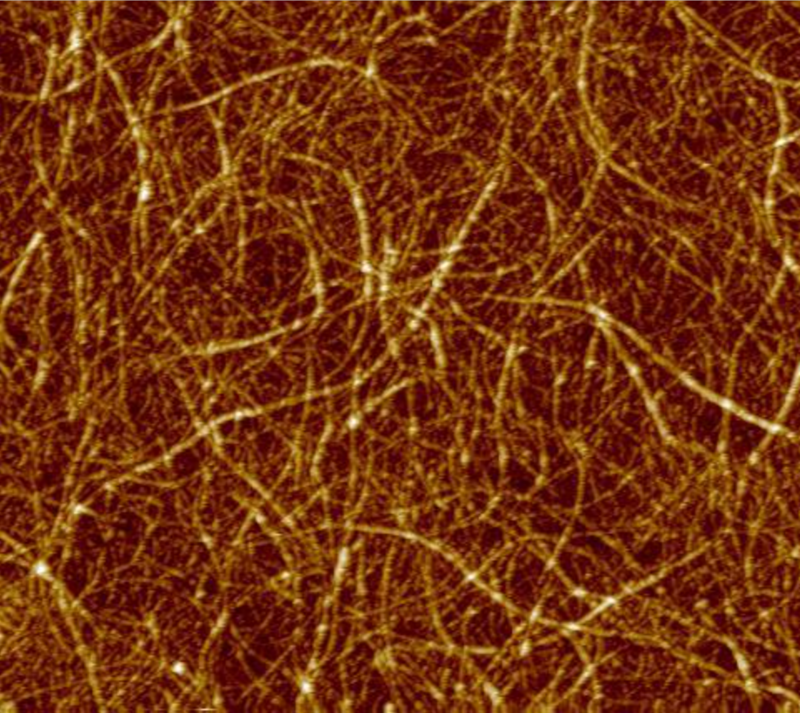 CENIDE Science Talk: AFM image of cellulose nanofibers (CNF). André was invited to give a talk on “Block Copolymers in Confinement” at the ACS Fall Meeting 2018 held in the Boston Convention and Exhibition Center. The conference week was packed with very enlightening talks on block copolymer microphase separation, active colloids, biomaterials, functional photonics, and liquid cell-TEM. The exhibition offered many new gadgets and funny giveaways (many types of "anti stress ball"). The city of Boston also offered much to see and explore, first and foremost the halls of MIT and Harvard University, but also Faneiul hall, Quincy Market, the harbor and the wales. The group welcomes Clement for the next 3 months. He currently is 2nd year PhD in the bio-inspired photonics lab led by Silvia Vignolini in the Department of Chemistry of the University of Cambridge. During his research stay, he will be synthesizing fully biocompatible block copolymers for photonic applications. A former collaborator of the Aalto University finished his thesis and successfully graduated. One of UDEs Juniorprofessors, Michael Giese, was an honorable guest of the defense and took on the role of the opponent. Johannes and André worked together on cryogenic electron tomography (cryo-ET) of complex polymer nanostructures. They were able to visualize the 3D structural features of multicompartment micelles in water and organic solvents. Johannes also worked on hybrid materials consisting of cellulose nanocrystals (CNC) and gold nanoparticles demonstrating geometric arrangement of the particles with precision interparticle spacing. The chiral twist of the CNC affects the positioning of the gold nanoparticles to give chiral plasmonics as verified in circular dichroism. The Göttinger Akademie der Wissenschaften awarded André with the Danie Heineman Prize 2018. The award acknowledges Andrés work on the synthesis of functional polymer nanoparticles and their use in hierarchical self-assembly into clusters, photonic lattices sand more complex multicomponent arrangements. This field of research will be expanded in the current Emmy Noether projects. The Award ceremony will take place in Göttingen on the 02/03.11.2018. This award is presented since 1961 every two years. Previous awardees can be also found here. André served as guest editor for Polymer (Elsevier) compiling a Special Issue on "Advanced Polymer Synthesis for Functional Nanostructures", which was finally concluded with a Andrés Editoral. The Special Issue contains 1 Feature Article by Stephen Cheng on polysilsesquioxanes as well as 29 papers covering advanced synthesis of polymers, block copolymers and polymer architectures for self-assembly in bulk and solution, functional materials and applications. 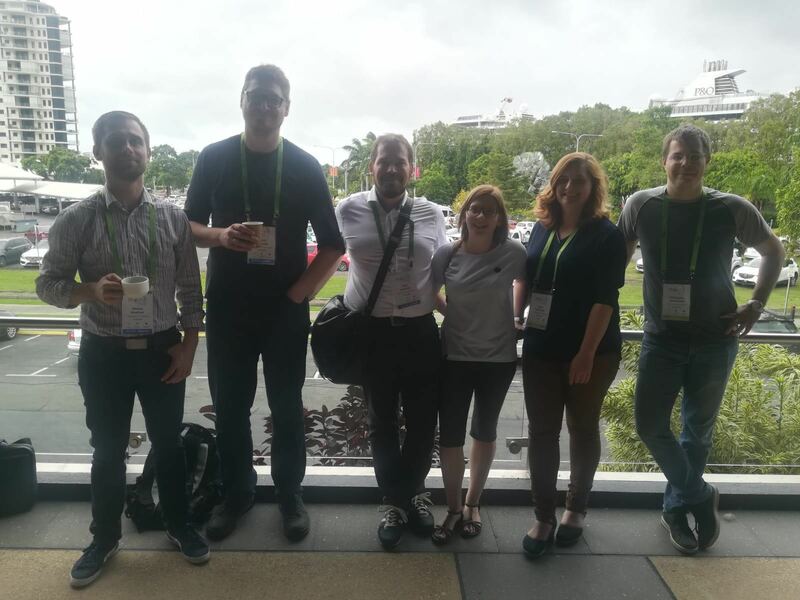 André was invited to give a Keynote lecture on “Confinement assembly of block copolymers to multicompartment microparticles” at the IUPAC MACRO2018 conference in Cairns, Australia, which took place from 01.07.-05.07.2018. The presentation was received very well and led to many interesting discussions afterwards. The quality of the talks on the entire conference was very high. Andreas Walther was the recipient of the Hanwha-Total IUPAC Young Scientist Award 2018 and gave an excellent presentation about their recent works on polymer properties of designed DNA and dissipative assemblies. During the conference André also served as chairperson in the morning session "Smart and Functional Polymers" introducing renowned scientists and rising stars. The conference was located close to the great barrier reef with beautiful landscapes. André had a very good time in Cairns meeting old friends and making new ones, and hopes to visit again some time for another meeting. He spend some extra time in Australia and traveled to Brisbane to see the campus of the Queens University of Technology (the CUBE!) and the university of Sydney where he visited the lab of Markus Müllner. 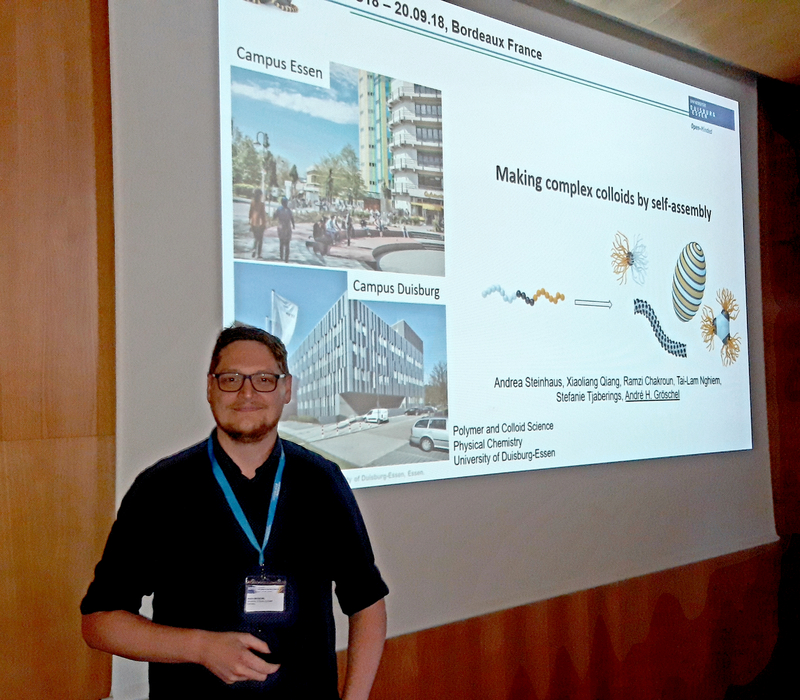 Alexander Tjaberings gave a presentation at the Sommerfest der Chemie on the Essen Campus and introduced the university to the group and its research projects. The presentation was much appreciated by the audience and led to discussions between group members and other groups as well as interested students. While at the Aalto University, André co-supervised M.Sc. Maria Morits who successfully defended her doctoral thesis and graduated. She worked together with André on lightweight bionanocomposites and mechanical properties of structural materials. Projects comprised the modification of nanocelluloses using ATRP and studied fracture mechanics on bulk nacre mimetic nanocomposites. The latter is a layered material of clay and polymer with exceptional strength, resistance to fracture, and fire shielding properties. 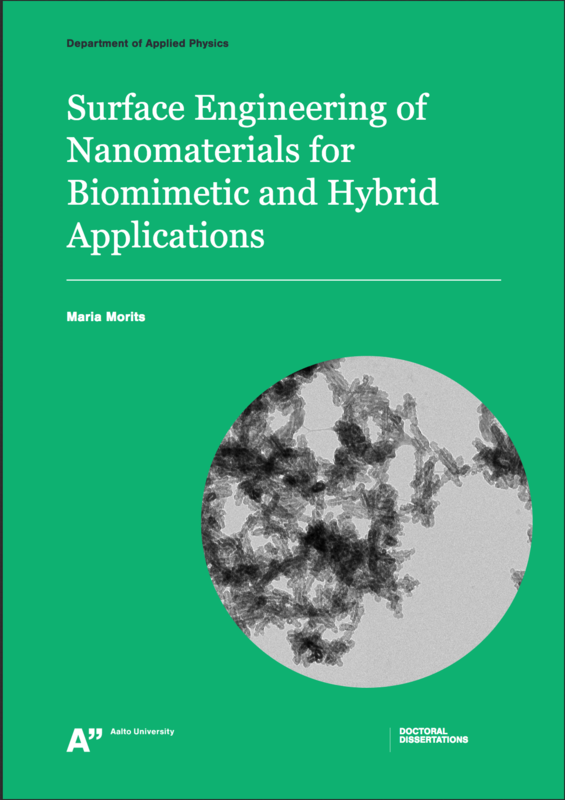 The cover on the right shows mineralized shells using cellulose nanocrystals as templates. The work generally deals with biomaterials, bionanocomposites and hybrid materials. André followed an imitation of his former Biology teacher (now Dean) Annett Becker and visited his old high school to give a presentation on “From Pegnitz into the world – The life and Work of a Scientist”. Unlike the typical audience of scientists, this time the audience was composed of teachers and parents who wanted to know about how to become a scientist, what a scientist does and learn about polymers. The presentation was followed by 2 hours of Q&A on polymer materials, plastic waste and where polymers enrich our daily lives. News articles about the interview can be found here. André was invited to participate the Young Polymer Chemist forum in Shanghai, China. He traveled first to Hangzhou where he met with Felix Schacher to visit Jun Ling, a former colleague from Bayreuth and now researcher at the Zheijang University. Felix and André gave presentations and had discussions with group members. They especially enjoyed a guided tour given by Jun through the extensive and extremely impressive Lingyin-Tempel in Hangzhou. After this visit they traveled to Shanghai to visit another colleague, Weian Zhang, at the East China University of Science and Technology (ECUST), where André gave a presentation on "Block Copolymer Photonics". Finally, they went to Donghua University in Shanghai to attend the 3-day Symposium giving a presentation on confinement assembly. The symposium featured early career researchers in equal parts from China and Germany fostering research collaborations. Helmut Cölfen from University Konstanz gave a very interesting presentation about bone implants. This was the first trip to china, which left an very positive impression. The paper of Andrea Steinhaus was accepted earlier this year, but now we received the back cover of the Special Issue of Macromolecular Rapid Communication on collaborations between Germany and Australia. The back cover illustrates in an Artwork the arrangement of block copolymer brushes inside the confinement of nanoemulsion droplets. 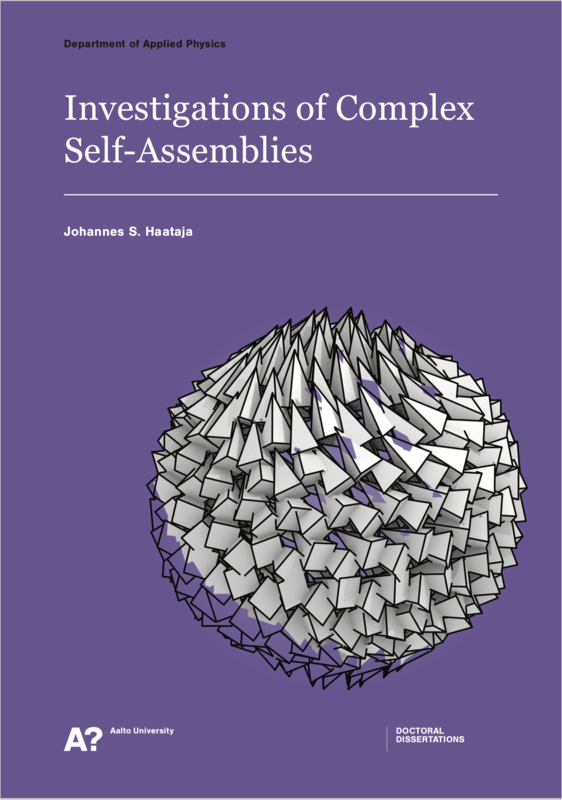 In an group effort, we published a book chapter on "Self-Assembly of Soft Nanoparticles" in the reference series "Comprehensive Nanoscience and Technology" published by Elsevier. The bock chapter which contains over 400 references, 60 pages and 46 figures about the synthesis and self-assembly of colloids, patchy particles, micelles, their superstructures and potential applications. Nicole Janoszka started her Master thesis on the synthesis and characterization of microparticles produced by emulsion polymerization. The microparticles will consist of a loosely cross-linked network and contain catalytic centers for heterogeneous catalysis. Over the course of her thesis, she aims to study the effect of cross-linking density, amount of catalyst and size of particles on catalytic performance. André followed an invitation to the Fussum group by Ville Liljeström who is currently Postdoc at the renowned Norwegian University of Science and Technology (NTNU) in Trondheim, Norway. André delivered a talk in the physics colloquium on "Complex Colloids by Self-Assembly" and gave two lectures on Soft Matter. The Fossum group has great expertise in active structuring of colloids using electro-hydrodynamic forces as well as long-standing expertise in clay materials. The stay peaked in a long evening of great food and discussions about future trends in materials science as well as potential collaborations. A joint paper got accepted in Macromolecular Rapid Communications with Andrea Steinhaus in the leading first author role. The publication is the first in a series in two ways: first, it deals with confinement assembly of block copolymers and will be followed by more research conducted by Andrea; second, this publication marks the first installment of a hopefully long tradition of papers between the Müllner group @ University of Sydney and the Gröschel-Lab @ UDE. The paper by Andrea deals with studies on the confinement assembly of molecular diblock bottlebrushes into well-defined axially stacked lamellar discs or bicontinuous networks (depending on block size). The paper shows for the first time that polymer topologies such as bottle brushes have an impact on the way multicompartment microparticles develop. The bottlebrushes were provided by the Müllner group. TOC graphic shows diblock bottle brushes in confinement-assembly resulting in lamellar microparticles. On 15.03.18 André went to TU Dortmund to give a talk on "Self-Assembled Colloids: Building Particles from the Bottom-Up" in the polymer seminar on invitation of Prof Jörg Tiller. After the talk André had very fruitful discussions with the Tiller group, but also very inspiring discussions with Prof Ralf Weberskirch from the Organic Chemistry Department potentially leading to new collaborations in the field of micelle catalysis. 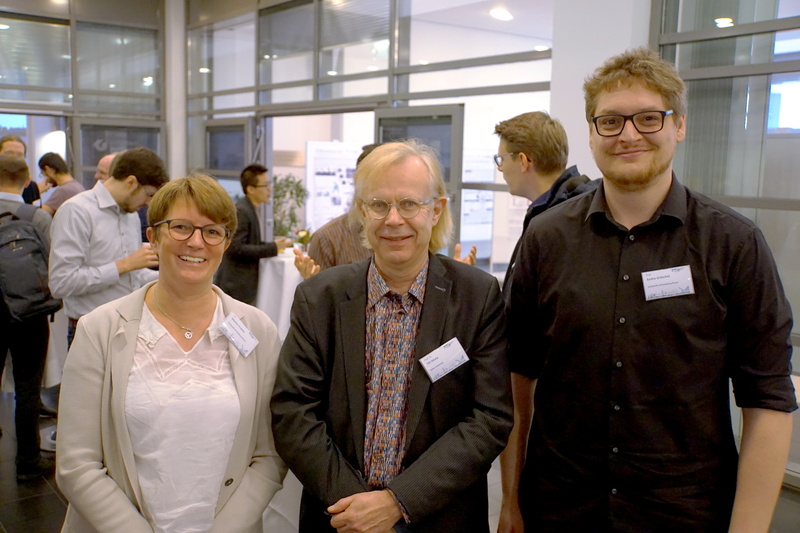 The short trip to the neighboring university was strengthened the links between polymer related research groups within the University Alliance RUHR. The group has moved to the NETZ building in Duisburg and has settled in entirely new but empty laboratories. 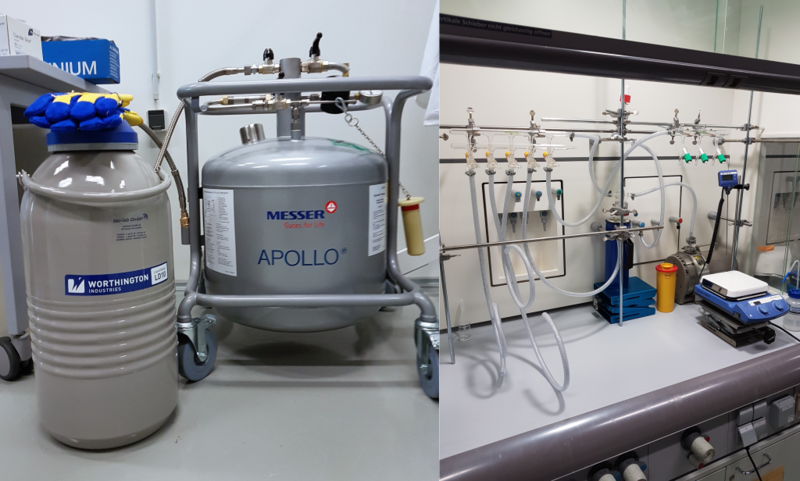 Thus, the last couple of month one of the main focus was to equip the lab with large amounts of consumables, glassware and gadgets. Finally, one of the last deliveries of glassware arrived today incl. drying oven, new glassware for Schlenk set-up, dewars, liquid nitrogen storage tank, pumps, rotary evaporator, magnetic stirrers and more. Special thanks to Axel and Tai for the many orders. 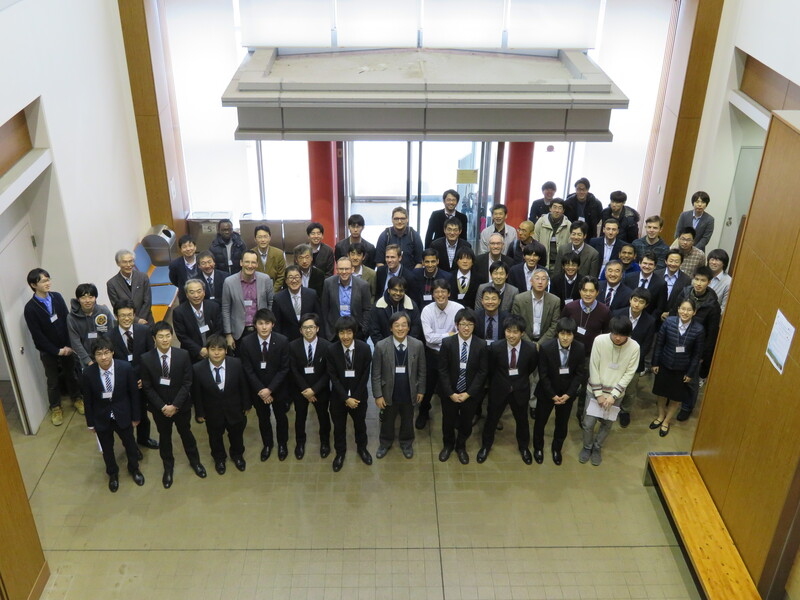 From 06.03.-12.03.18 André went to the 2018 Joint Symposium on Energy Materials Science and Technology in Tsukuba to deliver an invited talk on "Block Copolymer Templates for Energy Applications". The conference is the 8th installment in a series aiming at joint research between several institutes around the world, where CENIDE acts as one of the driving forces (the 6th Symposium was held 2016 at the NETZ). The Symposium featured 35 presentations and about the same number of posters. Overall the conference was a very enlightening trip into the world of energy materials and the culture of Japan. In the article "Block Copolymer Micelles for Photonic Fluids and Crystals", we describe the precision assembly of block copolymers to micelles with super-stretched corona, yet, with narrow size-distribution to qualify as building blocks to form tunable and reversible micellar photonic fluids (MPFs) and micellar photonic crystals (MPCs). The BCMs form free-flowing MPFs with an average interparticle distance of 150−300 nm as defined by the electrosteric repulsion arising from the highly charged and stretched corona. Under quiescent conditions, millimeter-sized free-floating MPCs with classical FCC lattice grow in the photonic fluid-medium upon refinement of the positional order of the BCMs. We discuss the generic properties of MPCs with special emphasis on surprisingly narrow reflected wavelengths with full width at half-maximum (fwhm) as small as 1 nm. We expect this concept to open a generic and facile way for self-assembled tunable micellar photonic structures. TOC graphic showing photonic crystals of block copolymer micelles of PS-b-P4VP assembling into hexagonal lattices in 2D (cryo-TEM) and fcc lattices in 3D. In February, the entire group went to Freiburg to participate the Macromolecular Colloquium 2018. The conference is the biggest and most important in Macromolecular Science in Germany with about 1000 visitors each year (all in only one lecture hall). This years conference featured 3 days of packed sessions of insightful talks opening with energy-dissipative assembly on day 1. Andrea Steinhaus was able to acquire one of highly competitive poster slots and gave an excellent presentation on the confinement assembly of triblock terpolymers to generate Janus Nanorings. This is undoubtedly the first and only time a doughnut filled the entire wall of the auditorium. The poster attracted much attention with equally much discussion at the poster stand (doughnuts included!). Overall, it was a packed trip with evening gatherings at Martins Bräu, talks, discussions and dinners. 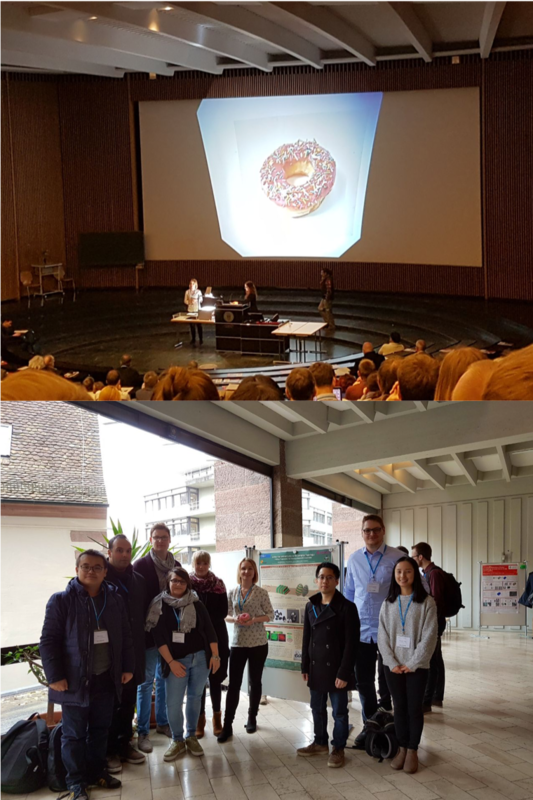 The group made connections to other researchers and gathered much experience at the biggest conference on Macromolecular Chemistry in Germany. 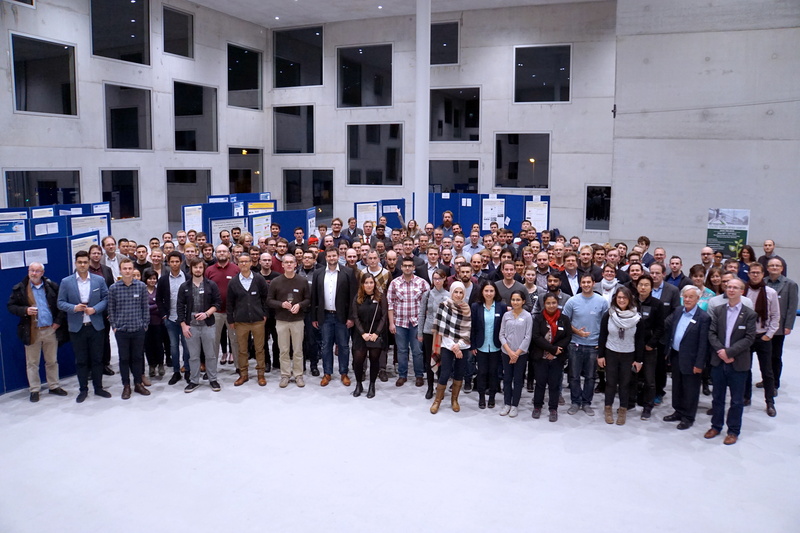 The 3rd CENIDE conference took place from 19-21.02. at the Karl-Schulte Haus in Bergisch Gladbach offering three days of strategic and scientific discussions amongst about 90 participants. The conference featured 21 talks in morning sessions focusing on broad fields of research or introductions to running and planned coordinated programs. Afternoon sessions were divided also into 21 presentations of young researchers highlighting recent research achiements. The scientific programm was further accompanied by poster sessions with 24 posters. The non-scientific program between sessions and in the evening comprised a relaxed atmosphere to exchange experiences, discuss future events and projects. A special highligth certainly was the table-fussball tournament! A new GPC set-up was installed today by PSS and is up and running. From now on it is possible to run two GPC systems in parallel for the detection of polymers in THF and DMAc with different RI-detectors and multi-wavelength UV-detectors. 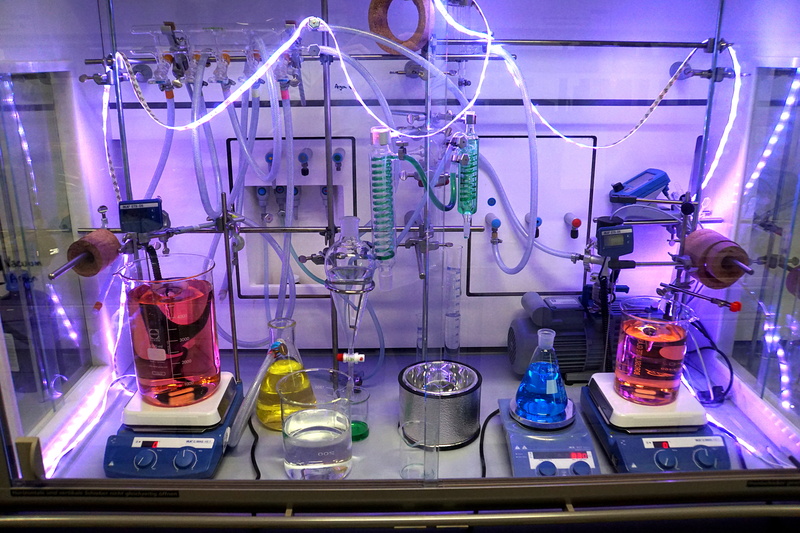 The lab is thus now equipped with setups that allow high throughput screening of polymerization kinetics. The first successful polymerization kinetics of block copolymers have already been measured! Prof. Dr. Markus Retsch, Lichtenberg-Juniorprofessur for Polymer Systems at University Bayreuth, gave a talk about thermal transport in nano- and mesostructured materials. The talk is part of the PC/ThC Colloquium series which will be coordinated by André in the future. Markus has studied in Bayreuth and did his PhD at the MPI for Polymer Research in Mainz, and his Postdoc at the MIT with Prof. Ned Thomas. Markus has recently received an ERC Starting Grant and was appointed Professor in Bayreuth.